When Alex Cabagnot played for GlobalPort, he was trying to lead the Batang Pier to better times. 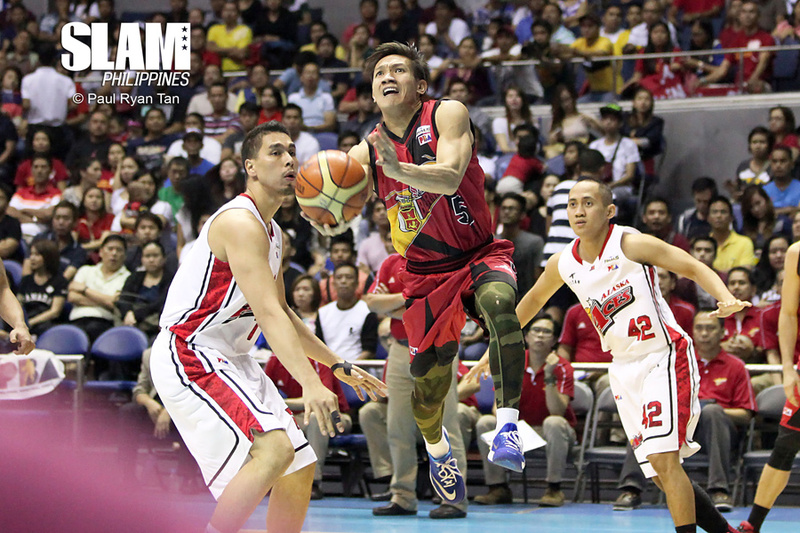 Now that he’s back with San Miguel, Cabagnot understands that his role has changed. A day before he was traded back to the San Miguel Beermen, Alex Cabagnot was still trying to be the leader GlobalPort Batang Pier needed him to be. It was December 9, 2014. The young franchise was reeling off a loss to the Meralco Bolts. A win could have earned them a twice-to-beat advantage in the 2014 PBA Philippine Cup quarterfinals phase 1. Instead, GlobalPort now needed to beat the Ginebra Kings twice to qualify for phase 2. It was a daunting task but Cabagnot believed it could be done so he gathered his teammates for dinner and a reminder that they’ve done it before, they could do it again. Cabagnot went to practice the next day at the Moro Lorenzo Gym inside the Ateneo campus where they celebrated Mark Isip’s birthday. They even posed for team pictures. On one side, Cabagnot was happy to reunite with his old teammates and be in a better spot. On the other, he felt for his Batang Pier teammates because he’d have to leave them right before one of their biggest games in franchise history. From the eighth spot, Cabagnot was plucked and reinserted to the team that was tied for first. From a 5-6 win-loss record and fighting for survival, Cabagnot suddenly found himself safe in the semifinals. It was the exact opposite of what he went through ten months earlier. Back in February 18, 2014, Cabagnot was shocked to see four missed calls from Petron Blaze coach Gee Abanilla. “I just got back from Boracay with my girlfriend. Kakatalo lang namin sa Rain or Shine [in the Philippine Cup semis]. When I got back, I came from a workout and saw that I had four missed calls from coach Gee and I knew it was different because coach Gee never calls me,” Cabagnot said. “He calls me like once or twice in three weeks. Then all of a sudden ang dami niyang missed calls. The point guard knew it was big news but he didn’t expect it to be that big. From a perennial title contender, Cabagnot found himself with a team struggling to put wins together. From a stacked lineup, Cabagnot was suddenly surrounded by players who have seen either too many playoff games or too few. “Nabigla ako. It was a very tough season for me but I would not trade it for anything in the world,” he explained. 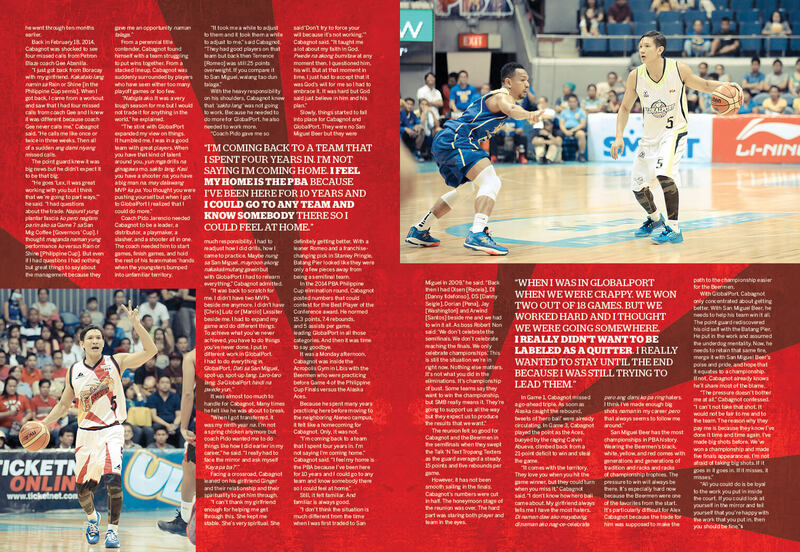 Coach Pido Jarencio needed Cabagnot to be a leader, a distributor, a playmaker, a slasher, and a shooter all in one. The coach needed him to start games, finish games, and hold the rest of his teammates’ hands when the youngsters bumped into unfamiliar territory. With the heavy responsibility on his shoulders, Cabagnot knew that ‘sakto lang’ was not going to work. Because he needed to do more for GlobalPort, he also needed to work more. “Coach Pido gave me so much responsibility. I had to readjust how I did drills, how I came to practice. Maybe nung sa San Miguel, mayroon akong nakakalimutang gawin but with GlobalPort I had to relearn everything,” Cabagnot admitted. It was almost too much to handle for Cabagnot. Many times he felt like he was about to break. Facing a crossroad, Cabagnot leaned on his girlfriend Ginger and their relationship and their spirituality to get him through. Slowly, things started to fall into place for Cabagnot and GlobalPort. They were no San Miguel Beer but they were definitely getting better. With a leaner Romeo and a franchise-changing pick in Stanley Pringle, Batang Pier looked like they were only a few pieces away from being a semifinal team. In the 2014 PBA Philippine Cup elimination round, Cabagnot posted numbers that could contest for the Best Player of the Conference award. He normed 15.3 points, 7.4 rebounds, and 5 assists per game, leading GlobalPort in all those categories. And then it was time to say goodbye. It was a Monday afternoon, Cabagnot was inside the Acropolis Gym in Libis with the Beermen who were practicing before Game 4 of the Philippine Cup Finals versus the Alaska Aces. Because he spent many years practicing here before moving to the neighboring Ateneo campus, it felt like a homecoming for Cabagnot. Only, it was not. Still, it felt familiar. And familiar is always good. The reunion felt so good for Cabagnot and the Beermen in the semifinals when they swept the Talk ‘N Text Tropang Texters as the guard averaged a steady 15 points and five rebounds per game. However, it has not been smooth sailing in the finals. Cabagnot’s numbers were cut in half. The honeymoon stage of the reunion was over. The hard part was staring both player and team in the eyes. In Game 1, Cabagnot missed a go-ahead triple. As soon as Alaska caught the rebound, tweets of ‘hero ball’ were already circulating. In Game 3, Cabagnot played the point as the Aces, buoyed by the raging Calvin Abueva, climbed back from a 21-point deficit to win and steal the game. San Miguel Beer has the most championships in PBA history. Wearing the Beermen’s black, white, yellow, and red comes with generations and generations of tradition and racks and racks of championship trophies. The pressure to win will always be there. It’s especially hard now because the Beermen were one of the favorites from the start. 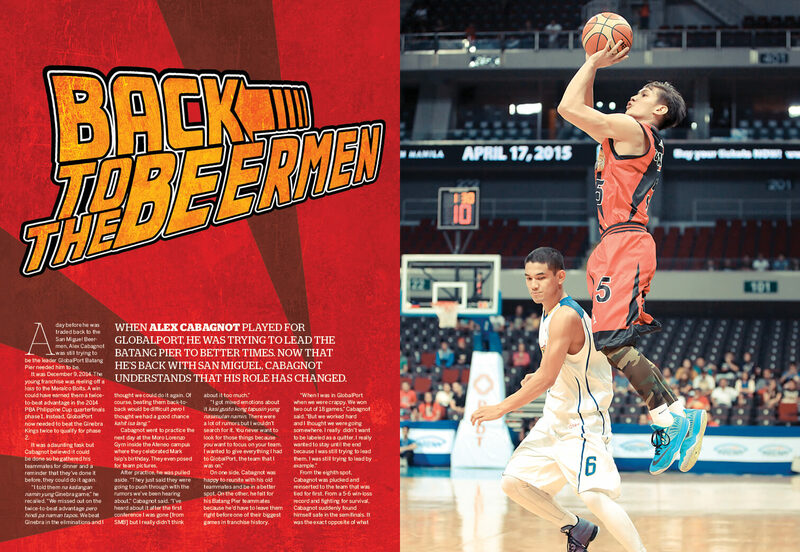 It’s particularly difficult for Alex Cabagnot because the trade for him was supposed to make the path to the championship easier for the Beermen. With GlobalPort, Cabagnot only concentrated about getting better. 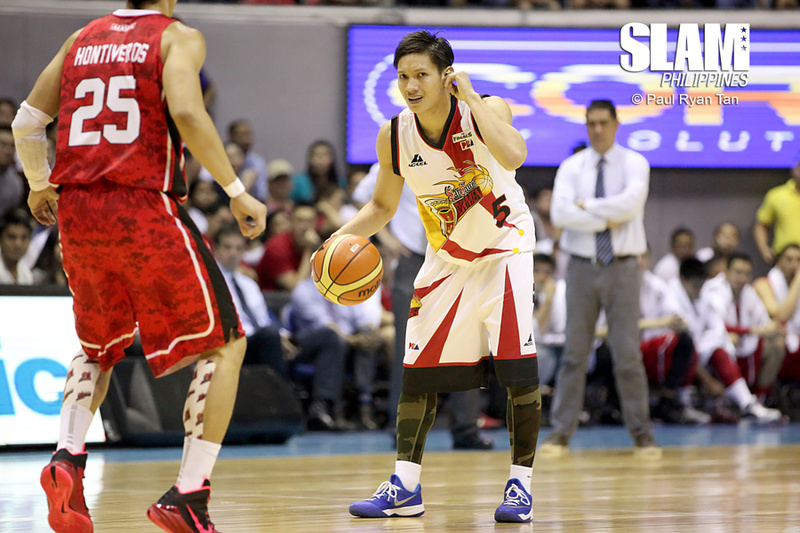 With San Miguel Beer, he needs to help his team win it all. The point guard rediscovered his old self with the Batang Pier. He put in the work and assumed the underdog mentality. Now, he needs to retain that same fire, merge it with San Miguel Beer’s poise and pride, and hope that it equates to a championship. If not, Cabagnot already knows he’ll share most of the blame.